You don t have time for those plain old watches! Slip something a little more stylish on your wrist. 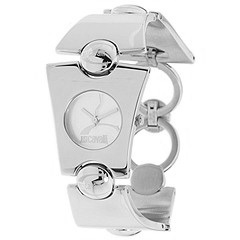 Stainless steel case and bracelet with folding clasp closure. Three hand analog quartz movement. Water resistant to 3 ATM. Face: 27mm W x 16mm H Face depth: 5.23mm Band width: 33.39mm Band circumference: 7.5 inches. Two year limited manufacturer warranty.